Sativas and sativa dominant hybrids will put the most weight in the scales, but these plants will have to bloom for a longer period of time in order to reach this result. Indica-dominant plants need less flowering weeks and can also ensure a heavy harvest in their own way. 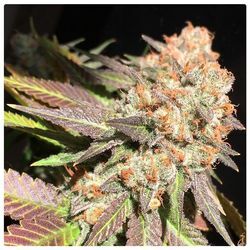 In this category all strains are represented that can achieve a heavy harvest considering their flowering time. Sanniesshop is keen to deliver genetics which give the highest possible yield, this is a characteristic of plants that we take into account when we make plant selections to use for a next generation. Whether you choose an indica or a sativa, we always try to create a strain that produces the largest possible buds. We have created strains that are easy to grow with a possibility of enormously heavy harvests. That is where Sannie became highly competent in. The old landraces are limited in terms of their maximum yield and by making crosses, hybrids have been created which have surpassed their large parents. By making selective crossings and using the large yielders to produce progeny, species have developed that generate a better harvest when a pure form is used. Apart from the fact that it is nice to be able to harvest a lot, it’s a challenge to keep the plants as healthy as possible until the end so that your harvest will also be optimal. Aside from high quality Sanniesseeds has become well known for the high yielding hybrids that are sold. Through strict selections and generations of crosses and breeding, Sannie has ensured that the hybrids sold also have a huge potential to put weight on the scale. So choose one of the hybrids from Sannie and you are assured of high potency plants which will provide you with a maximum harvest.